When Steve O’Conner set out to build his home, he wanted something at a grand scale. 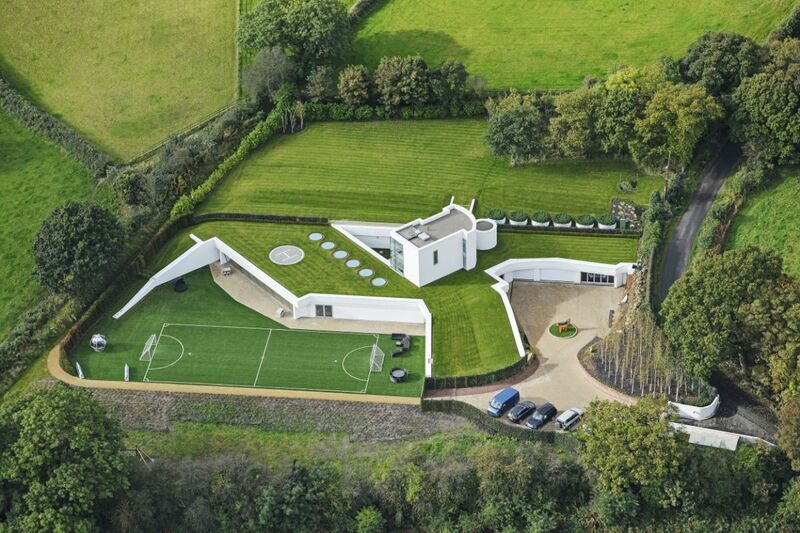 The real estate developer and rugby team owner chose a plot of land in the English countryside for his mega-mansion. He was ready to break ground when he ran into a fundamental dilemma: local zoning regulations did not allow him to build at the size he wanted. His solution was unique. The above ground portion of the home is made of two levels that contain bedrooms and baths for a total of 1,300 square feet. These levels jut above ground like we a well-designed periscope; with the master suite occupying the top sections. 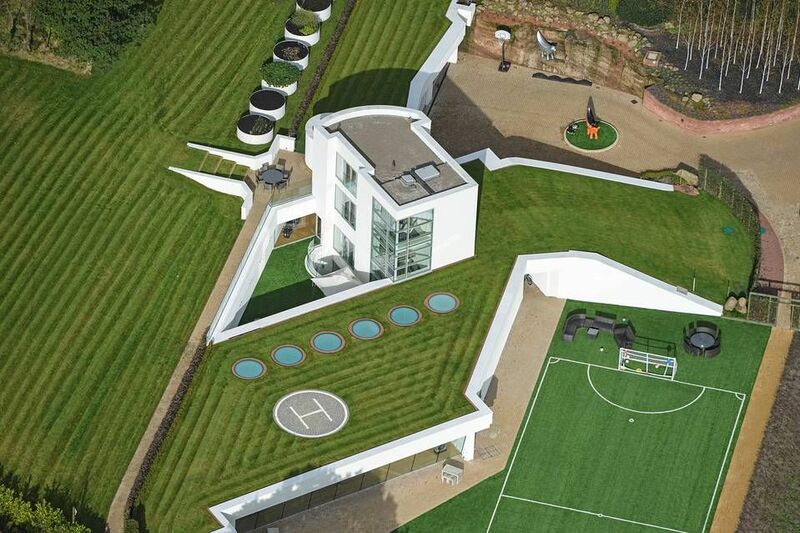 The home measures 13,600 square feet, and the remainder of that space is distributed across two subterranean levels. A courtyard in the home allows for sunshine to stream in during those rare moments in the English countryside when the clouds part long enough to enjoy it. Inside those lower levels, O’Conner has created a “natatorium” withan infinity pool. Lights in the water make it glow pink, while a nearby spa overlooks a large flatscreen where you can soak and watch current events or your favorite sports. It even has a sauna, steam room and built-in gym. The lowest level has a “sports bar” feel, with multiple game tables and televisions filling the space. Walk outdoors and you’ll come across O’Conner’s 40-foot soccer field. The arena is lined with viewing areas, a tree house, a fire pit, a zip wire and a small playground. Wondering how everyone gets around this large space? The family uses some of the scattered bicycles to go from points A to B. An incredible amount of fuschia-colored décor fills the home’s interior. The home has a total of 10 bedrooms, five bedroom suites and quarters for the staff of the home. 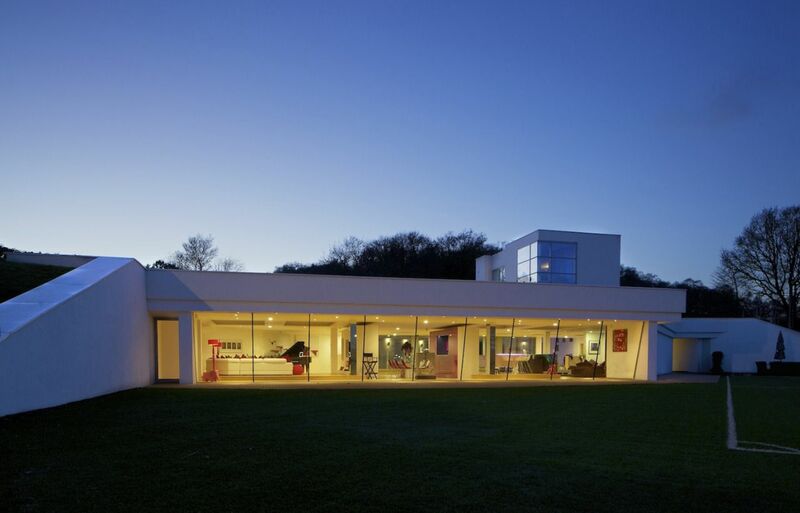 The home was built with a steel frame, which insulates it and keeps energy costs low. A ventilation shaft is used to draw in fresh air, filling the space with temperature regulated air for comfort. 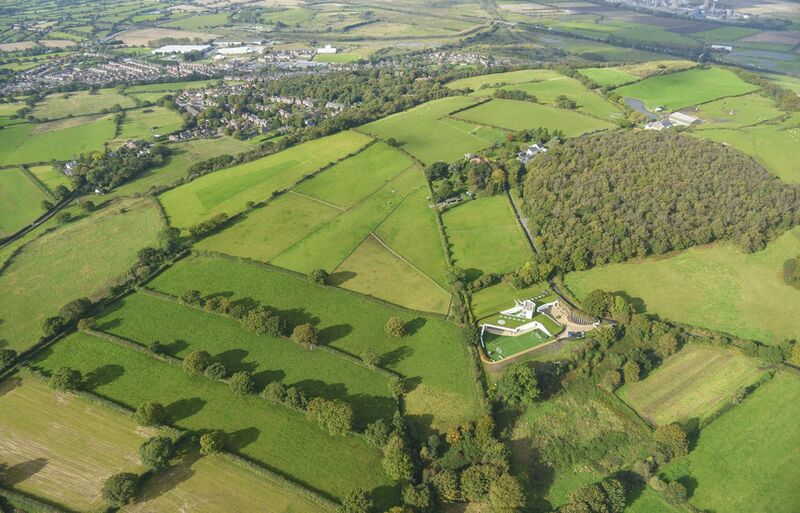 In addition to the home’s helipad, which is for O’Conner’s frequent flights to and from London, the property is situated for easy access to several international airports in both Manchester and Liverpool. The outside of the property is also lined with “superlambananas”, which are intriguing animal sculptures that are designed to be both animal and banana, created by the Japanese artist Taro Chiezo. O’Conner put the 9-acre home up for the asking price of $7.3 million. He named the property “Steppingstone”, which is one part allusion to his company and one part reference to his architecture. The property was designed to fit the lifestyle of a millionaire and his small family. He shares this space with his wife and two sons. There is another mansion in Southern California that share this underground design trend, the Hacienda La Paz. Both properties have dealt with public opinion regarding the space. While both owners swear there is plenty of light to be found, people around them seem to think they are akin to mole people who prefer living in the dark. The reality is that nothing could be further from the truth. While the O’Conners are looking to sell Steppingstone, they will move their family to Australia where Steve will begin his work on what he calls “Steppingstone II”.